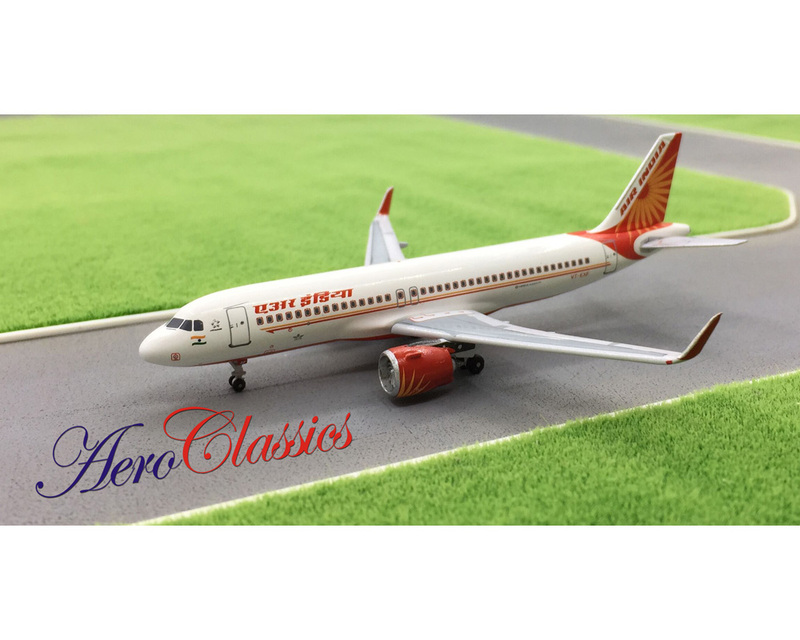 Coming this month from JC Wings, in both, 1:200 and 1:400 scales. 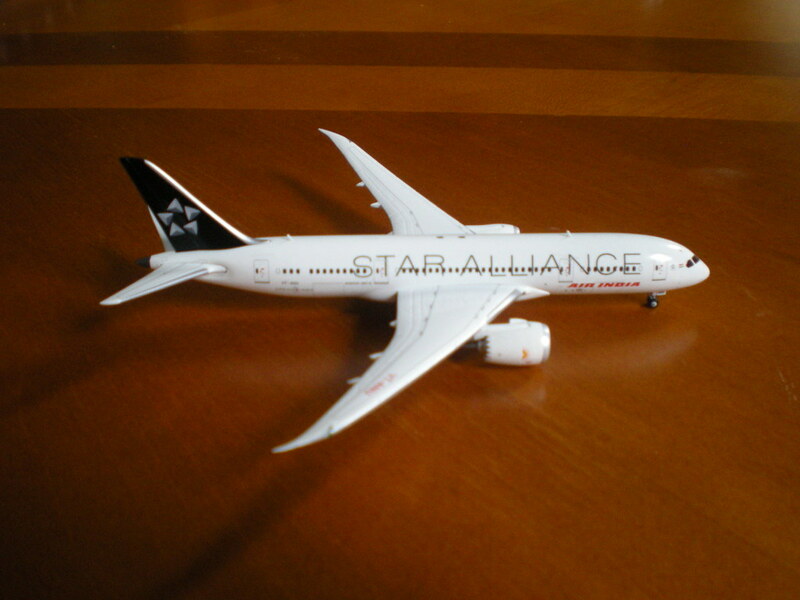 Air India B787-8 VT-ANU Star Alliance Logojet. Should be in my fleet by June. New addition to my fleet - Finally got my hands on what has now become a rather scarce model. 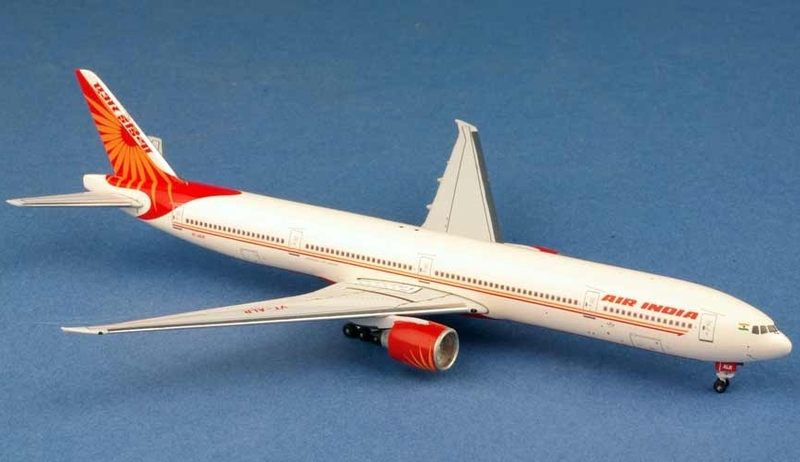 Dragon Wings 777-200LR VT-ALB "Arunachal Pradesh"
Witty Wings 777-200LR VT-ALE "Haryana"
I like to collect 1:200 if possible. 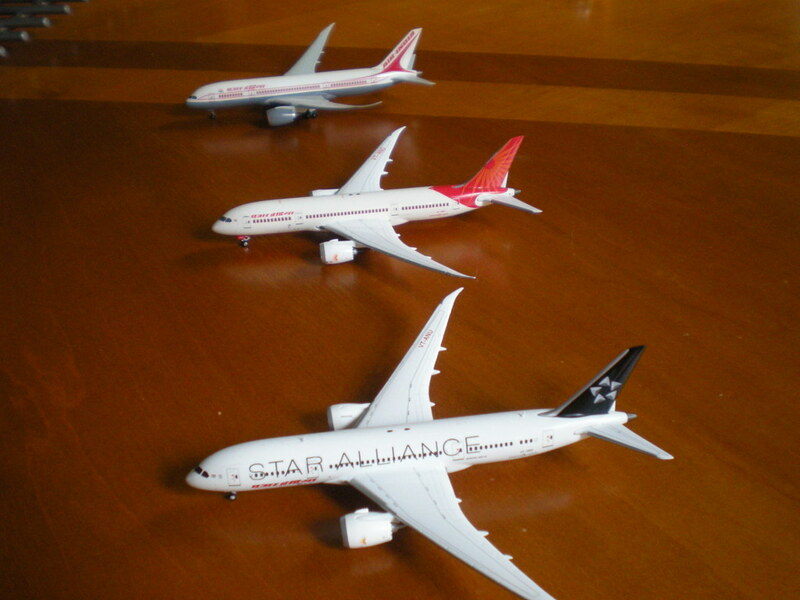 Could you please help me with some URLs for the Indian Airlines A300s and A320s and AI 707, Connies, and 747-200s. New release from AeroClassics this month - and in my fleet next week. 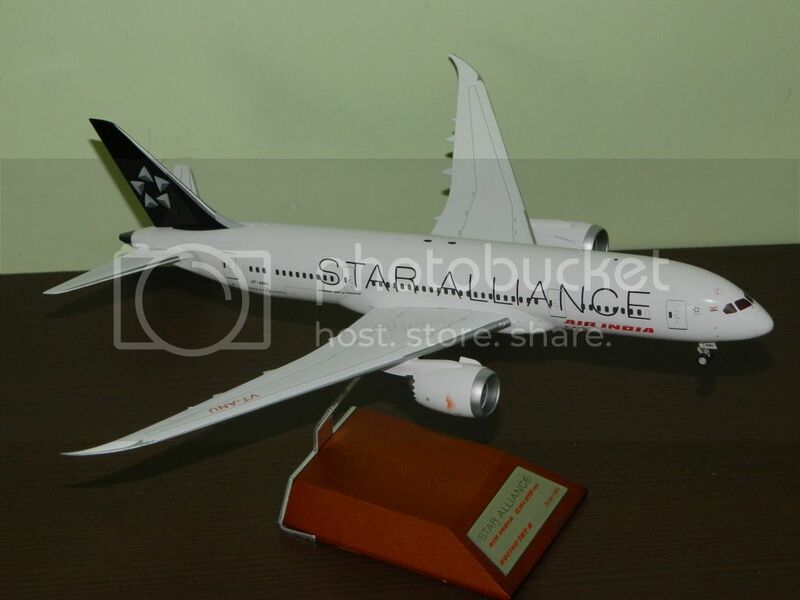 Air India B777-300ER VT-ALJ "Bihar" Star Alliance Logojet in 1:500 scale. 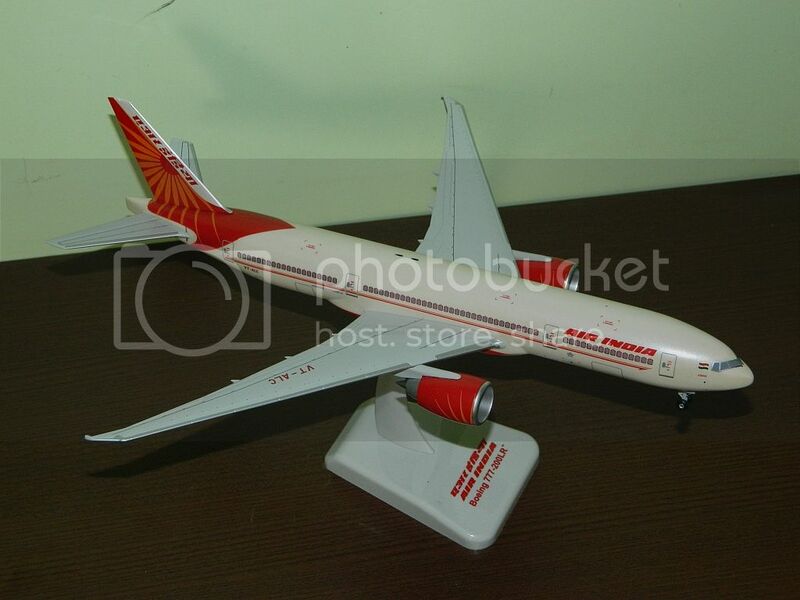 Is there anyway I can find a Gemini Jets B777-300 Air India VT-ALJ anywhere !? Keep your eye on eBay; that's your best bet. Last one listed there sold for $28 (+ shipping) last month, which is a steal, considering it was going for close to $100 last year. 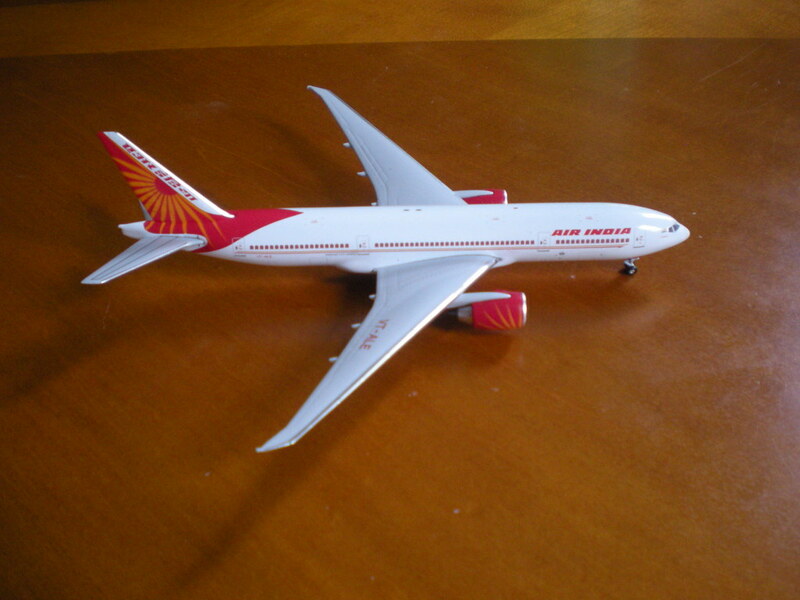 InFlight200 Air India Boeing 777-300ER VT-ALO "Karnataka" in 1:200 scale. 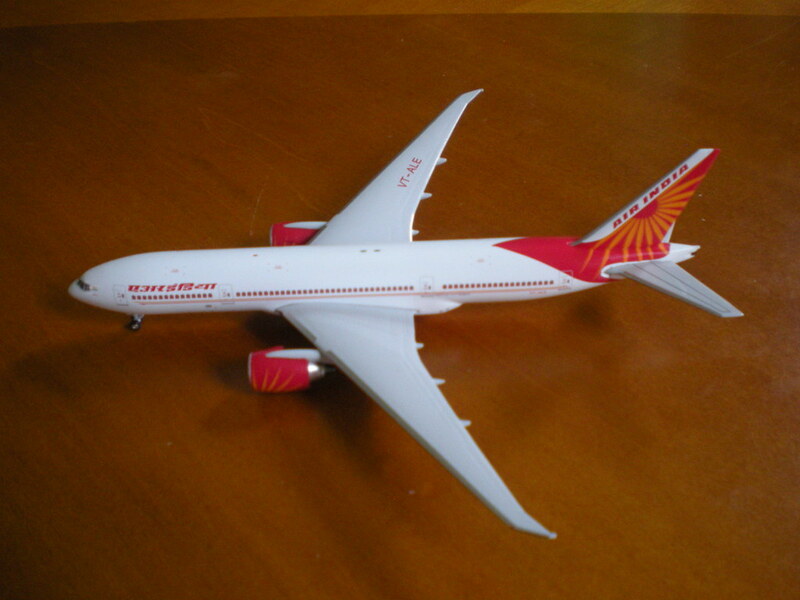 New release from AeroClassics this month - Air India B777-300ER VT-ALR "Meghalaya" in 1:500 scale. Himmat, that's awesome ! Is that your Dad's IAF shield ? Which Sqn did he fly the 748 for ? Was it Sqn 11 ? 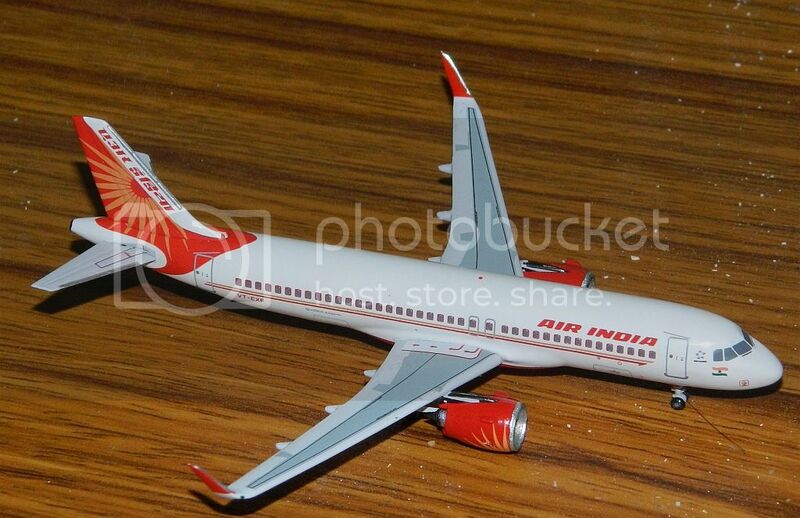 And is the model an IAF issued one ? Anyway, just wondering if you could repost a small sized version of the pic ? It's huge and too wide at least for my screen. Hope you don't mind. Thanks. And is the model an IAF issued one? I guess not, see the typo. Off-topic: the cockpit windows are a bit smaller than on the 748s, so the model isn't that accurate, either. 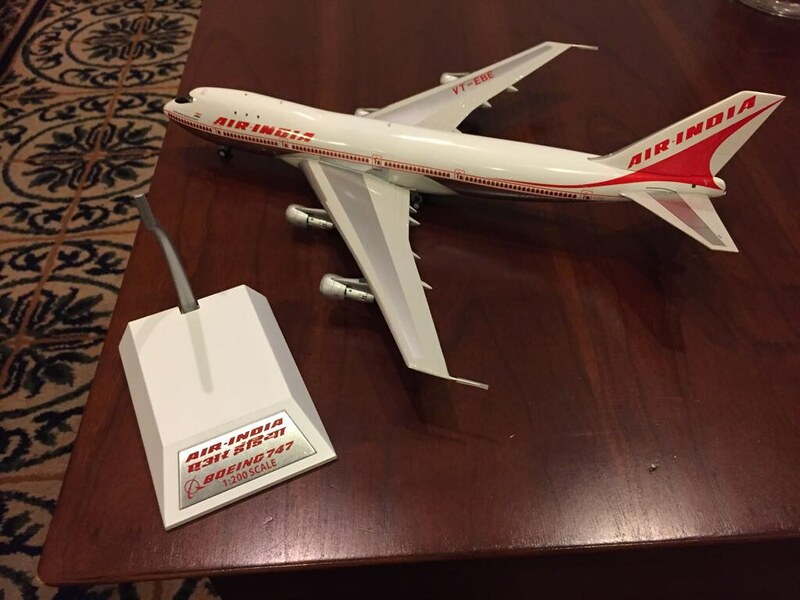 Yes, it's the IAF shield he received when he was deputed to Air India. He flew the HS 748s for the Comm Sqdn and then as the CO of FIU. 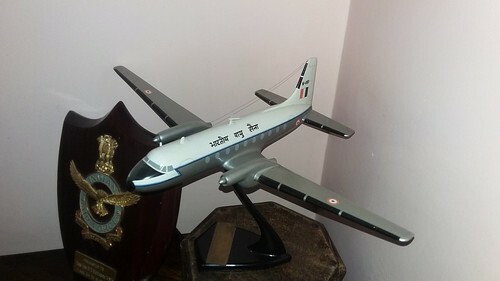 It was gifted by the Station Commander of IAF Station, Palam. Not really sure about its origin. 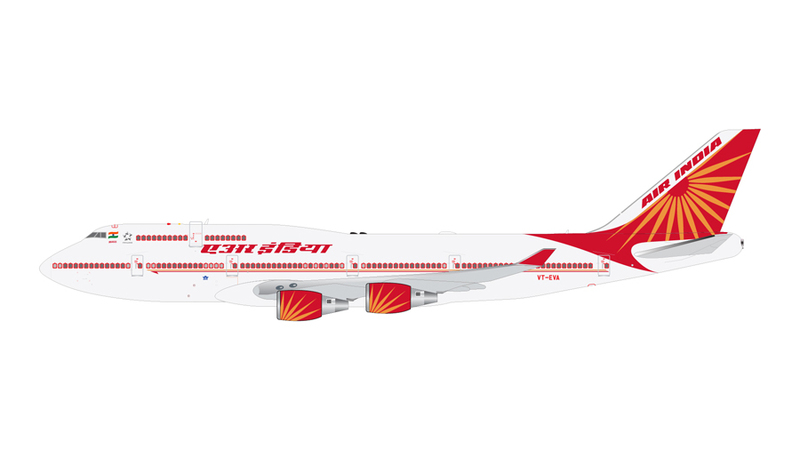 The 747-200 goes well with the Inflight200 707 and 747-300, all aircraft that my Dad flew for Air India - & that I flew aboard, with him. 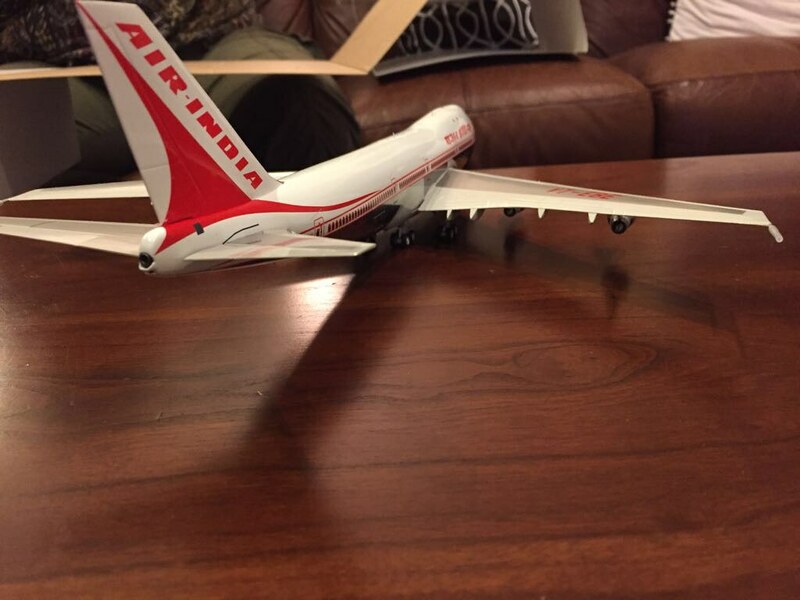 When it rains Air India models, it pours Air India models ! don't have much of model collection, but would want to know which manuf produces the best finished product? 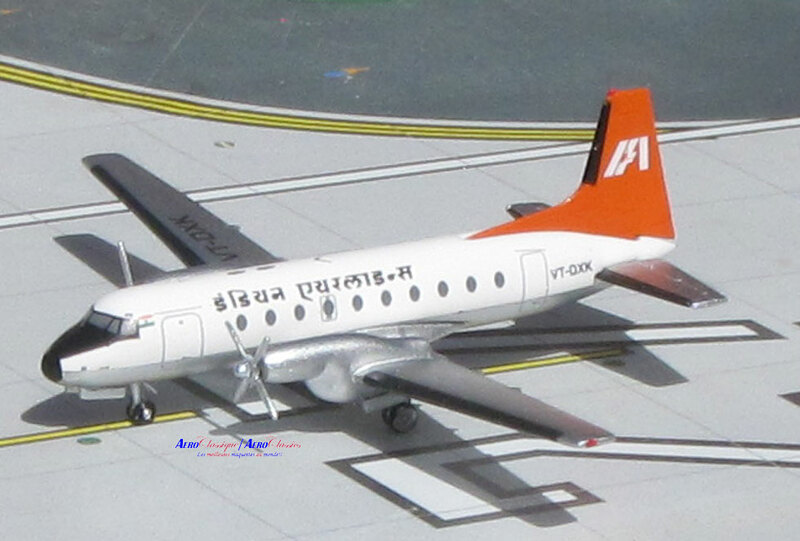 In my opinion, Inflight 200 in the 1:200 scale category, and Phoenix Models in the 1:400 scale category offer the best finished product. 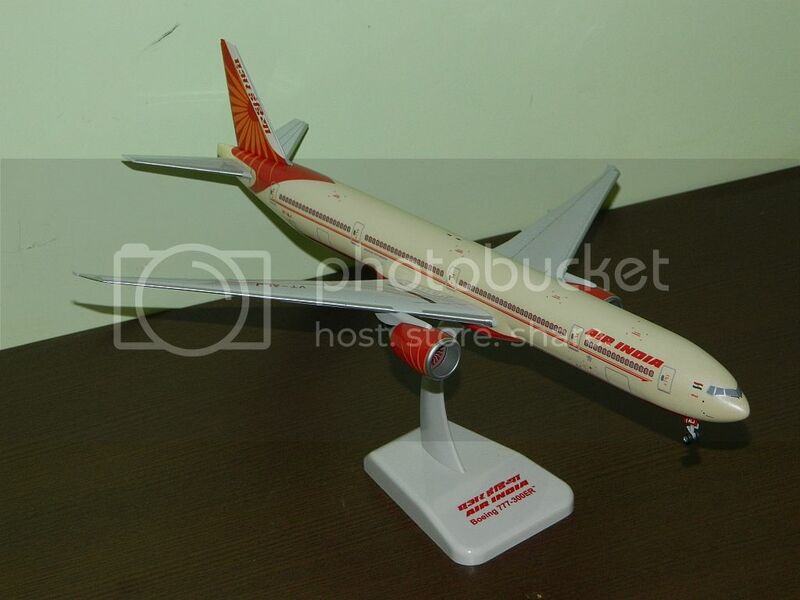 A hat-trick from Aeroclassics : 3rd Air India model in 3 months. 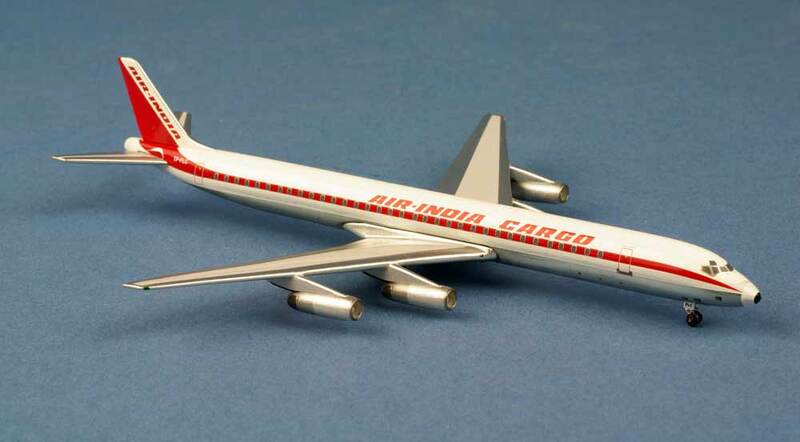 Air India (Air India Cargo) Douglas DC-8-63 TF-FLC in 1:400 scale. 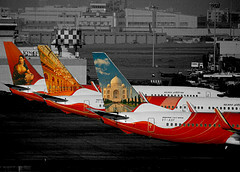 Another Air India coming up - sadly, an airplane and livery that's been produced waaaaaay too many times, in my opinion. 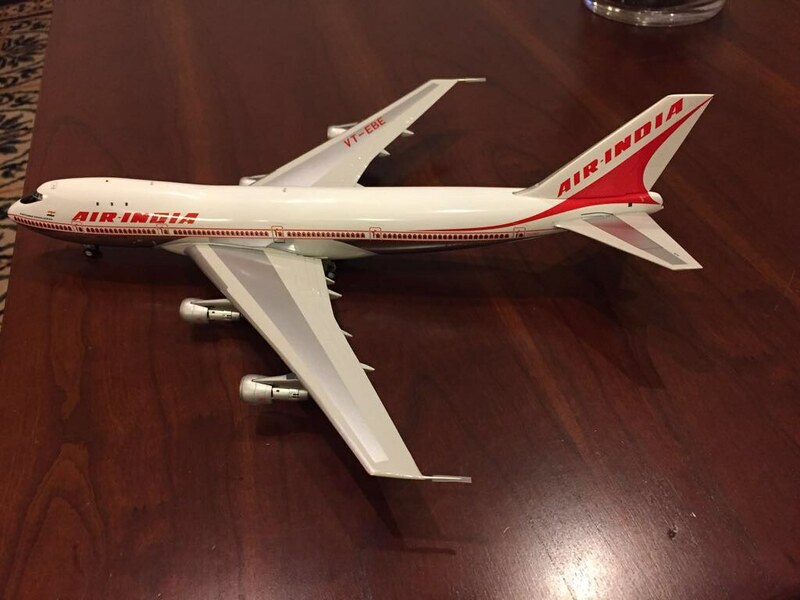 Air India Boeing 747-400 VT-EVA "Agra" in 1:400 scale. 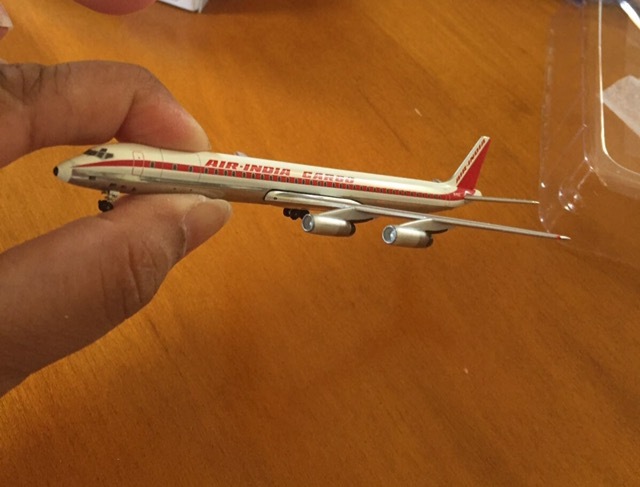 First pic of the production model of the DC-8. 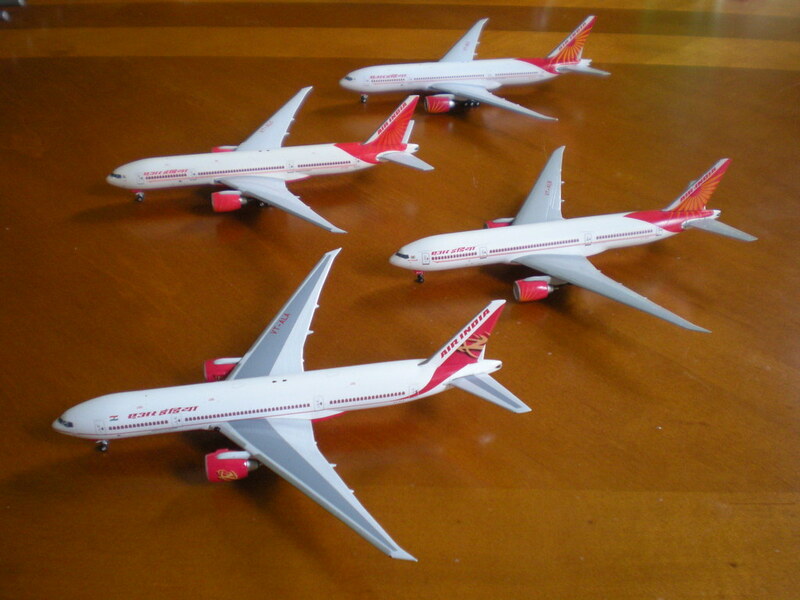 Joining my fleet next week - will make a wonderful addition to the 707s. Added these two to my fleet this past week. 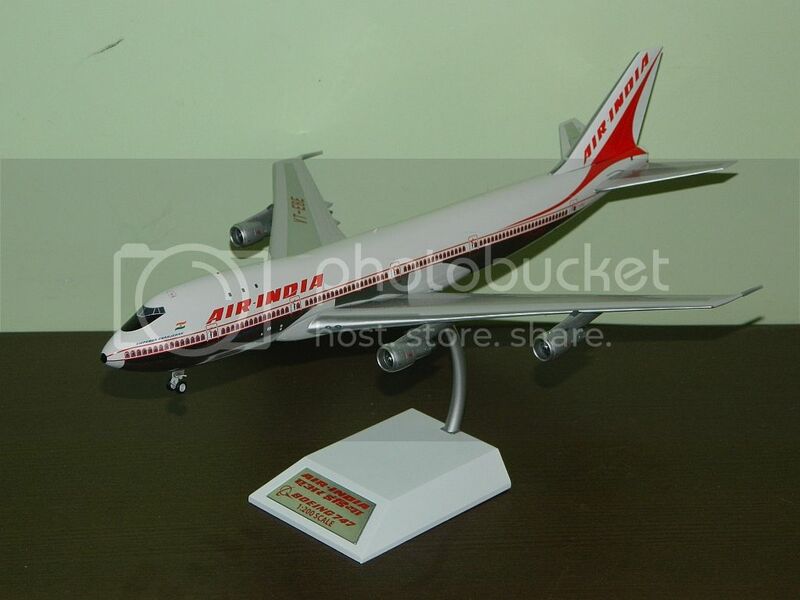 And yet another masterpiece of an Air India model coming in October. 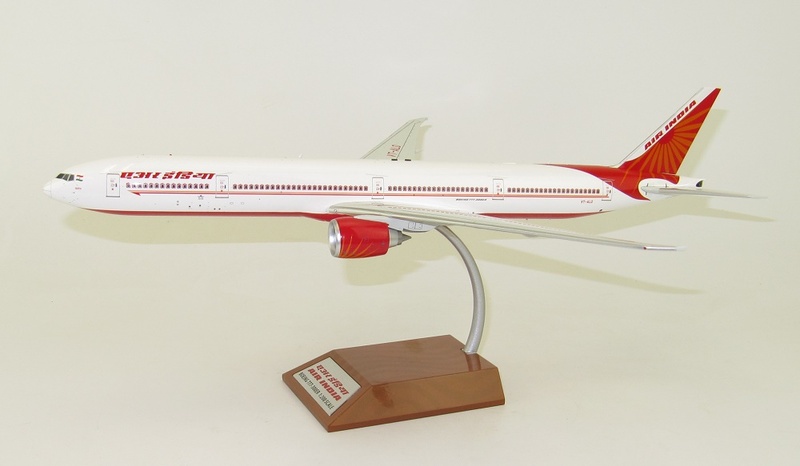 Inflight200 Air India Boeing 707-400 VT-DJK "Everest" in 1:200 scale. A great companion for sistership "Annapoorna" in my fleet. First production pictures - that's one great looking model !! 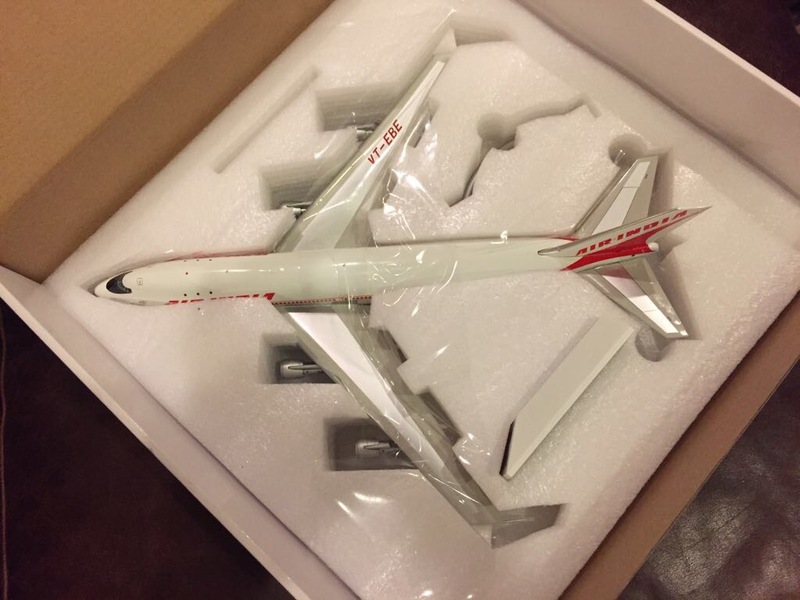 And so Inflight 200 ruins another model. 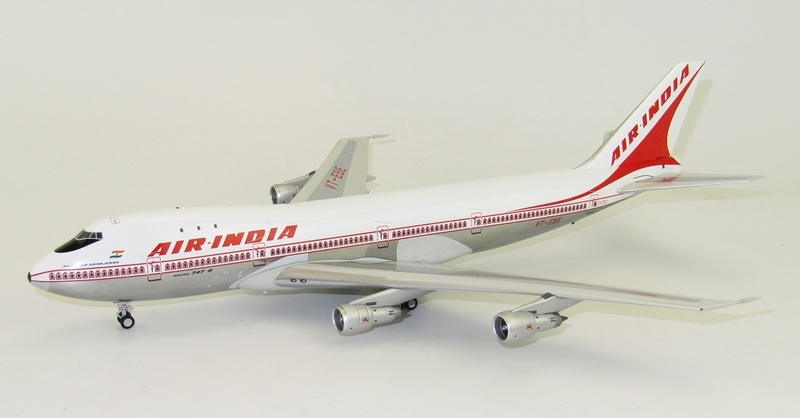 This new air india 707 is messed up in so many ways. First the engine pylons on top of the wings should be red all the way . The engines themselves are flattened at the top along the sides. Next the silver chrome at the tail cone should be below the tail planes and not above. Nose cone is too pointy but that isn't that much of a big deal as the other issues. I did not purchase this model for the reasons above. 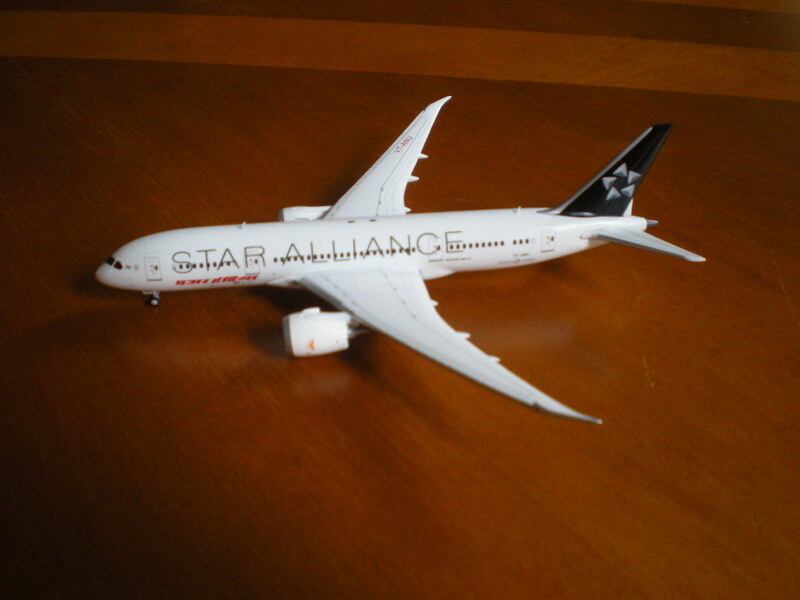 Nor did i purchase the inflight 200 777-300 since they screwed up the tail logo at the leading edge. 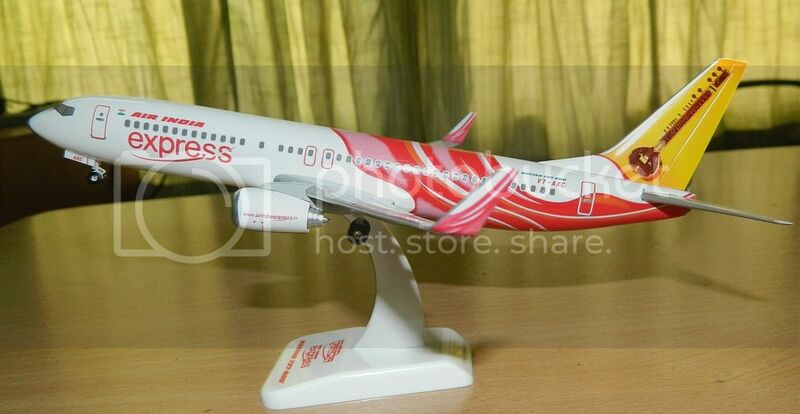 the red should curve almost at the point level to the fuselage. instead it curves too high and ruins the appearance. 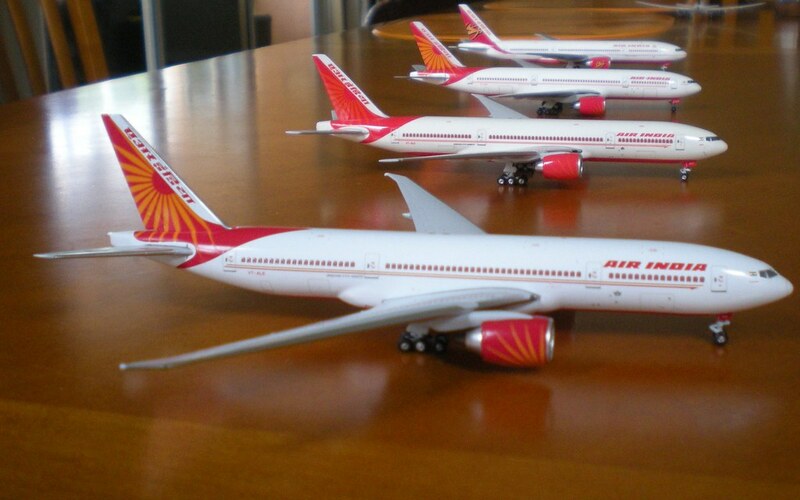 That AI A320 looks less impressive, compared with the rest of your superlative collection. 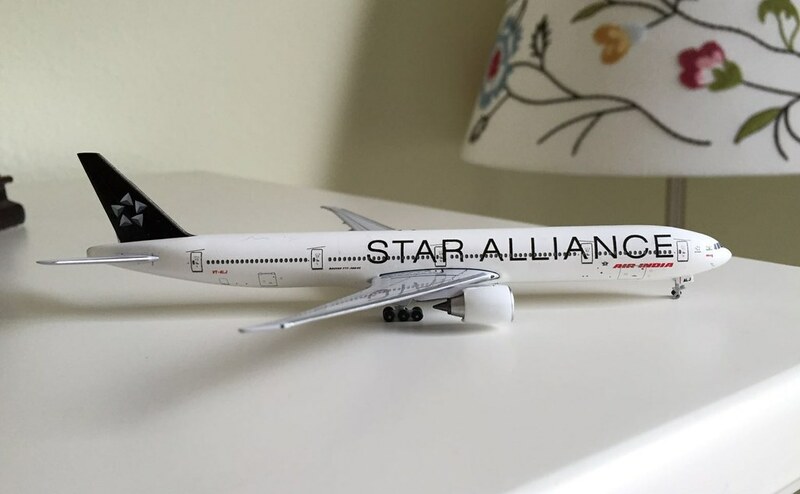 Maybe it is just the aircraft. 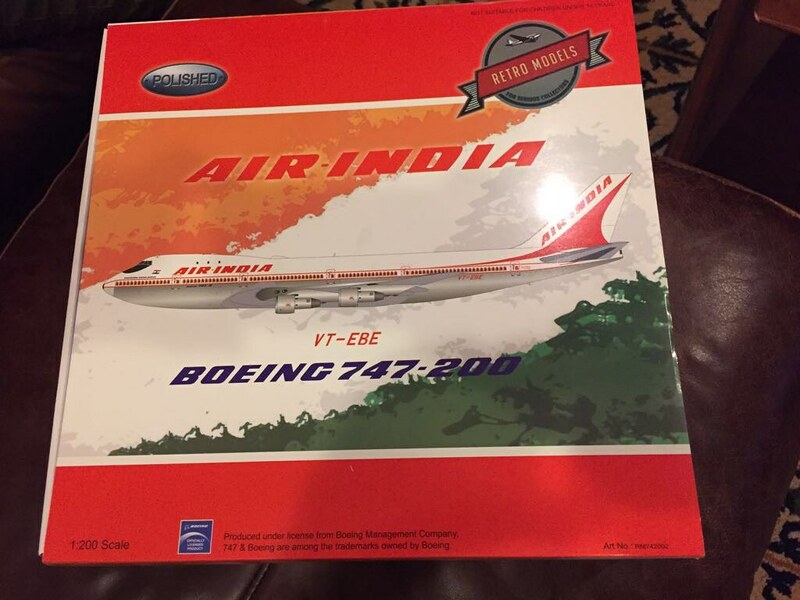 You could probably use it as a dispensable when friends or relatives visit your place and their kids ask to play with one of '747 uncle's planes'. 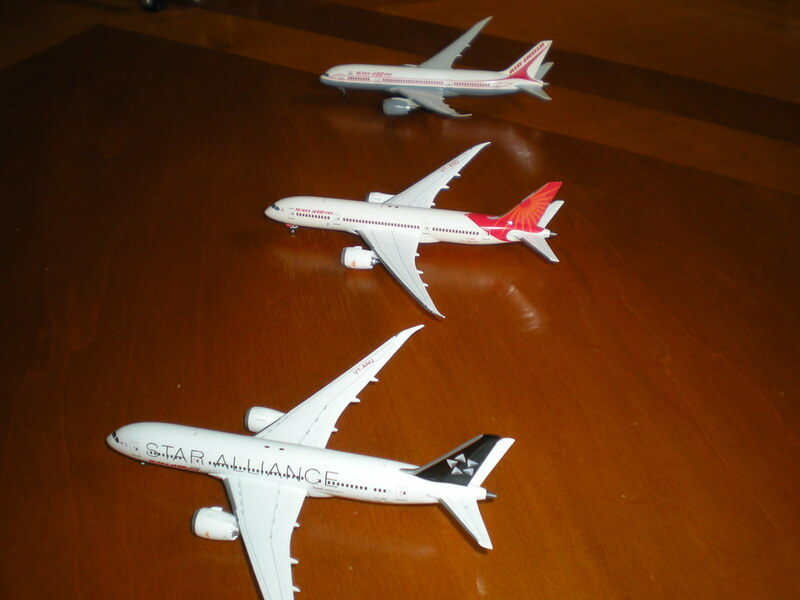 Cannot afford to hand the kids one of your rare Constellations or 747s. Simply cannot. 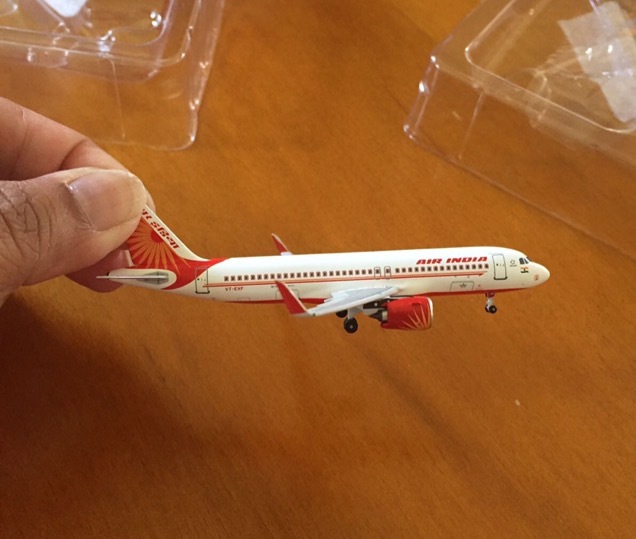 But yes, I agree, the narrowbody models in 1:400 scale are not nearly as attractive as the others, especially the AI A320NEO & the A321CEO. 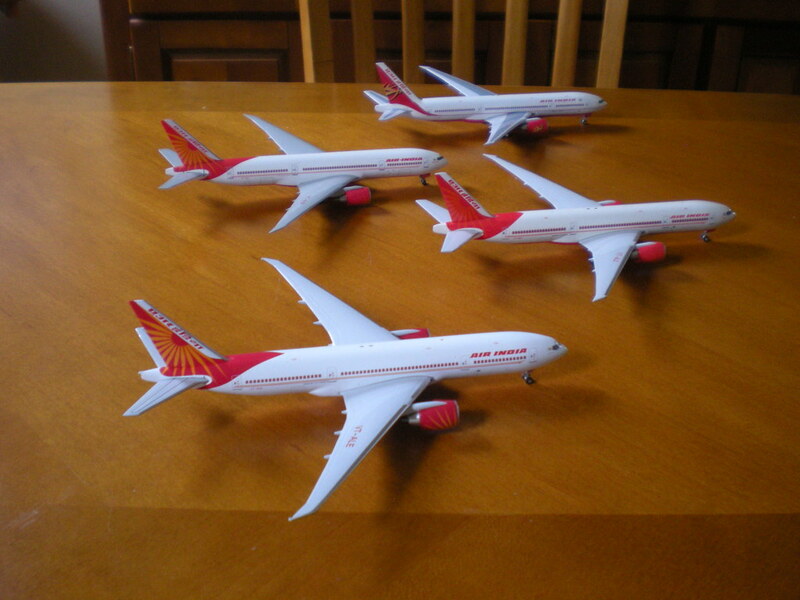 My first post here and here are the Air India models in my collection. 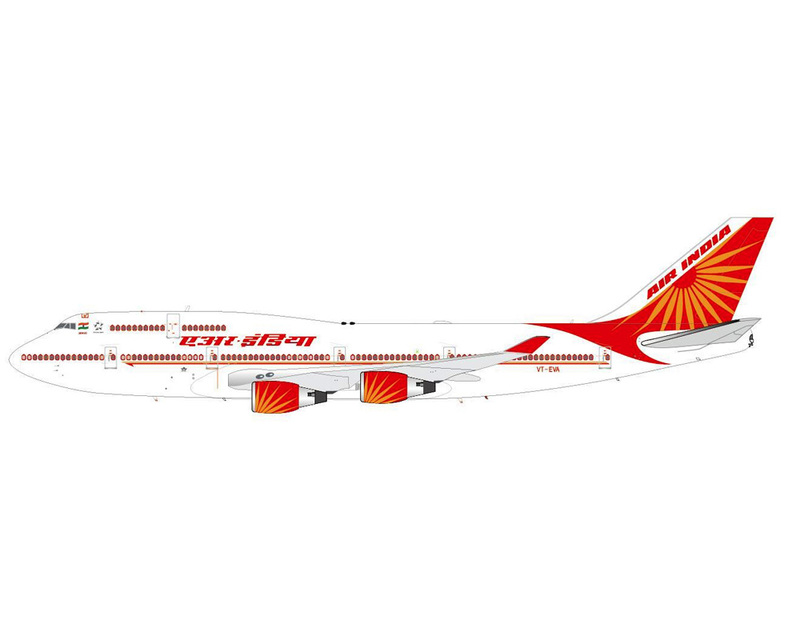 Inflight Retro 1/200 Air India Boeing 747-200 VT-EBE "Emperor Shahjehan"
Hogan 1/200 Air India Boeing 777-200LR VT-ALC "Assam"
Hogan 1/200 Air India Boeing 777-300ER VT-ALJ "Bihar"
That is one impressive collection you've got. Congrats and thanks for sharing. 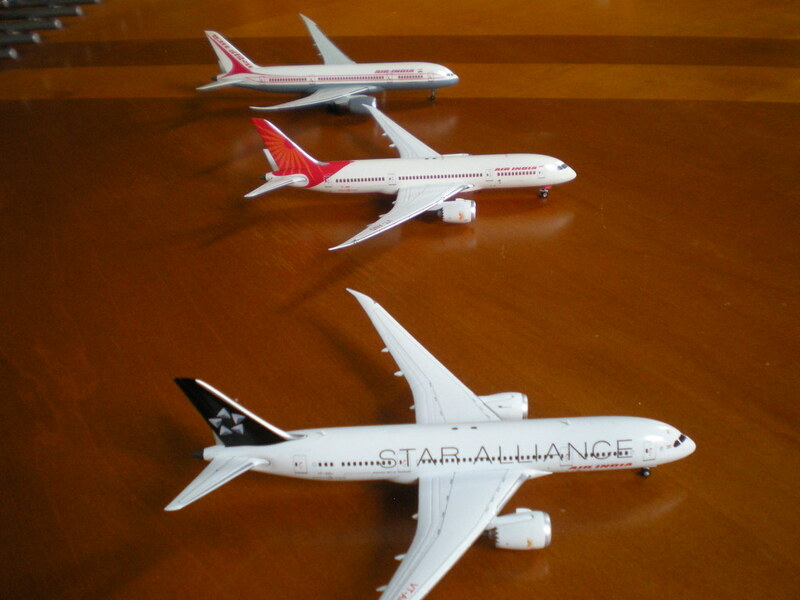 Planning on competing with our friend @747-237?